Santolina, commonly known as Lavender Cotton is a small shrub with soft, woolly, finely divided foliage, that make neat, rounded bushes. 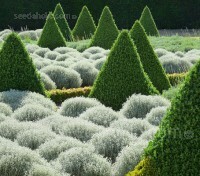 They are valuable for mass planting, ideal for knot gardens and small hedging around herb gardens etc. It will stand any amount of clipping and shaping - a perfect plant for control freaks. 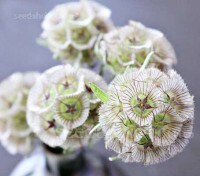 The papery bracts of Scabiosa stellata is an example of perfect geometry. A delicate geodesic sphere of translucent papery, cone shaped bracts adds a new shape to the garden. 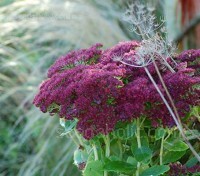 The everlasting seed heads make excellent cut flowers and are perfect for dried arrangements. Hugely impressive in any garden, Sedum telephium ‘Emperors Wave’ boasts succulent, blue-green foliage and masses of star-shaped flowers in glorious shades of deep pink and purple. 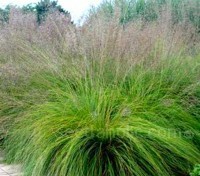 They are popular with late season perennials and ornamental grasses. The extreme contrast in flower shape enhance each other, adding to the textures and colours of the late season garden. Sedum telephium ssp. maximum is native to mainland Europe, it is quite common in gardens in its multitude of forms or as a parent of a cultivar, In summer it produces stunning creamy-white flower heads comprising of a multitude of tiny individual blossoms. Sedum ussuriense is at its best in late summer and through autumn, the blue-green succulent, rounded leaves are followed by a glowing display or carmine-red flower clusters. It even pleases the eye in winter when its seed heads turn into a stage for dew drops and ice crystals. 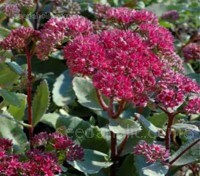 A mixture of many attractive low-growing sedum varieties representing a wide range of foliage types and flower colours. 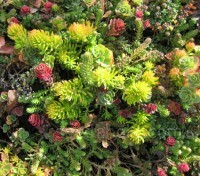 Low maintenance, durable and interesting, grow them on walls or banks, as a ground cover or as a green roof. Sedum strut their stuff where many other plants dare not venture! 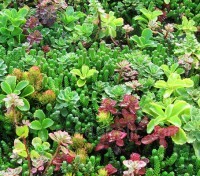 Sedum Roof Garden Mix is a formula mixture of many important varieties for roof gardens in full foliage and flowering colour range. Low maintenance, durable and interesting, grow them on walls or banks, as a ground cover or as a green roof. Sedum strut their stuff where many other plants dare not venture! 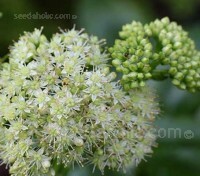 Selinum wallichianum is a plant that combines strength and structure with delicate refinement. It has had high praise from some of the most discriminating of gardeners. E A Bowles called it ". 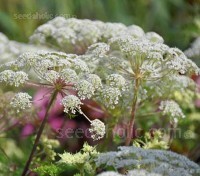 . . the queen of all umbellifers, with its almost transparent tender green-ness and the marvellously lacy pattern of its large leaves . . . the most beautiful of all fern-leaved plants". 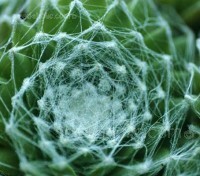 Always an interesting plant, Sempervivum arachnoideum is an exotic and interesting variation which forms small green rosettes of fleshy leaves, the tip of each leaf connected to another by a network of silvery filaments that resemble a spider’s web. 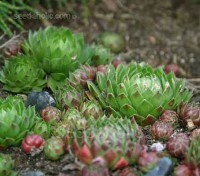 Whether planted in large numbers or used as a single specimen Sempervivum are both beautiful and enduring. A selection of winter hardy species, the sheer variation of colour, texture and size of these fascinating succulents is almost infinite and their tendency to produce offsets makes for easy increase. Native to Europe, Sempervivum tectorum is a widely-planted succulent that has been grown in and around human settlements for millennia. Their rosettes are fascinating with their succulent leaves radiating around the centre, their colour hues are stunning and their tendency to produce offsets makes for easy increase. 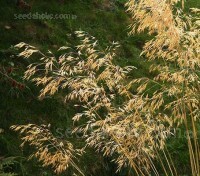 Setaria macrostachya is a perennial ornamental grass that is usually grown as an annual. 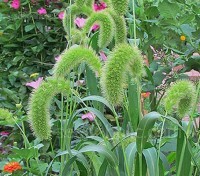 Long, erect, slender stems bear broad, arching leaves and produce lovely soft foxtail-like flower-heads. Suitable for growing in the garden or in containers they make a wonderful addition to the garden and the vase. Sporobolus displays a magnificent fountain of fine textured, emerald-green leaves which develop rich shades of reddish-gold or deep orange in the autumn, but the great joy of this plant is that it produces a great cloudy haze of tiny flower heads. Numerous stalks with delicate, open panicles shoot up and over the clump. What can I say? Its a plant you can pet!...Bees love it…children love it….and you just have to stoke it on the way past! 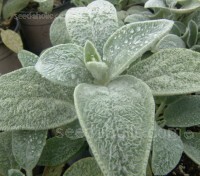 Lambs' ears is a well-known ground-covering perennial, popular for its soft, fluffy foliage, plus, it’s a great silver accent in between all the green going on in the garden. Feather Grass, Needle Grass. Aka ‘Lace Veil’. 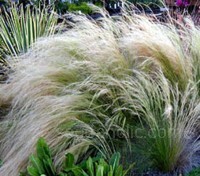 Stipa capillata 'Bridal Veil' is one of the prettiest perennial grasses. 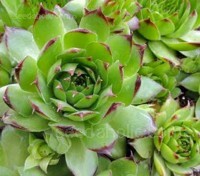 Forming a dense, glossy green clump of foliage they bloom in summer with beautiful upright plumes. The hair-like awns are at first clear green, and as they mature they turn a beautiful silvery-white. Stipa gigantea is the most dramatically beautiful of all grasses. It has the wonderful and fashionably transparent quality of providing height without bulk, tall stems of golden oat-like flowers allow glimpses into the garden beyond. Stipa tenuissima 'Pony Tails' is wonderfully impressive. 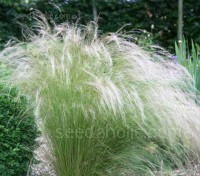 In summer, plants are covered with masses of elegant pale feathery seed-heads which are held a little above the foliage. These can be cut for use in arrangements indoors. Alternatively they make a useful winter food source for finches and other seed-eating birds. Artemisia annua, commonly called Sweet Annie is a graceful annual with tall stems with fine bright green ferny foliage. With sweetly fragrant foliage it has a wide variety of uses both medicinal and for handcrafting but is most often grown for fresh and dried arrangements. French Meadow-Rue, Greater Meadow Rue. 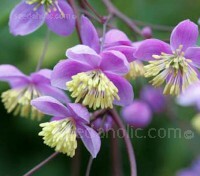 Thalictrum aquilegifolium 'Purpureum' features a basal clump of lacy, blueish-green foliage topped by a hazy, fuzzy show of purple flowers. They produce a shimmering hazy effect in beds and borders wildflower gardens or meadows. 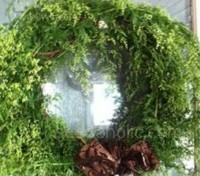 Both leaves and flowers are good for flower arrangements. 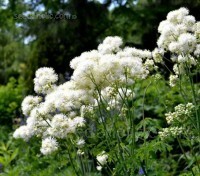 Thalictrum aquilegifolium album produces up a superb array of flower stems that rise above the foliage in late spring to early summer and are topped by a hazy, fuzzy show of white flowers. 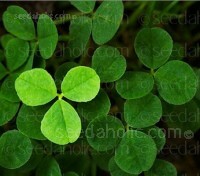 Despite their delicate appearance they are easy to grow with very little maintenance. Chinese or Yunnan meadow rue. 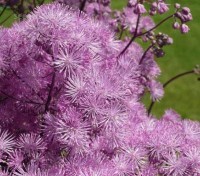 Thalictrum delavayi are invaluable for providing a contrast with heavier flowers, with light airy sprays of flowers that look, from a distance, like a mauve mist hovering among other plants. They flower for several weeks and succeed in a broad range of conditions . 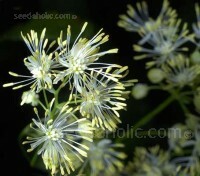 Thalictrum lucidum is a less well known species of meadow rue, it sports luscious deep green, fern-like foliage. In mid-summer the plant is festooned with a superb array of fragrant flower stems, topped with airy puffs of soft cream flowers each with bright yellow stamens. 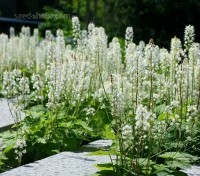 Tiarella is a small plant with heart-shaped leaves which makes a dense patch of foliage that is an excellent groundcover. An easy plant to grow: low maintenance, good in shade, and a long bloomer. It also works well in pots and containers. The Shamrock: a 3-Leaf Clover, is the national flower of Ireland and one of the county's most recognised and most loved national symbols. A crucial part of the celebrations on Saint Patrick's Day, March 17th, the tradition of wearing and “drowning” the Shamrock can be traced back to the early 1700s.